Fine woodworking projects sometimes require relatively precise, square-bottomed holes with smooth sides. This is especially true when drilling holes for dowels into plywood or dimensional lumber. Spade bits (sometimes referred to as paddle bits) can cut quickly but don't produce very smooth holes. Additionally, they tend to "blow out" the back side of the hole rather than cut cleanly through the end of the hole on the far side of the board. Twist bits can cut a relatively smooth-sided hole, but the bottom of the hole will be tapered, and they aren't commonly used in larger diameters than 1/2-inch. Auger bits are great for drilling quickly, but the holes they leave behind certainly aren't going to win any beauty contests, as they cut far too aggressively to give a clean hole. Hole saws can be used to drill through holes of diameters up to 4-inches, but you can't cut a partial-depth hole with a hole saw -- they have to be through holes. For cutting a hole to accommodate a dowel (with a squared-off end), the best of the aforementioned choices would either be the spade bit (which may leave a bit of a rough entry point and somewhat rough edges) or the twist drill bit (which is only available in smaller sizes and leaves a tapered bottom to the hole). In these cases, a better choice would be to use a Forstner bit, which is designed to make precise holes that have flat bottoms (with the exception of the small pilot point in the center) smooth sides and a clean entry cut with limited splintering in any type of wood. There are a few different varieties of Forstner bit, but the main premise of the bit is a cylindrical cutter that acts a lot like a spinning two-bladed bevel chisel. As the bit spins around the center point, the two cutters slice away at the wood. If the cutters on the Forstner bit are sharp, the wood appear to cut in long chips, much like sections of an apple peel. Most Forstner bits have smooth sides that keep the bit centered in the hole and tend to hone the sides of the hole a bit. The bottom of the hole will remain perpendicular to the long axis of the bit's shank, no matter whether the hole is being drilled squarely to the face of the board, or at an angle. For dowel holes, having smooth sides and a flat bottom gives an ideal amount of mating surfaces for gluing the dowel into the hole. Forstner bits typically come in kits with a variety of sizes included within the kit's carrying case. However, some fine woodworking suppliers do sell them individually. Most Forstner bit kits start with the smallest bit at about 3/8 inch and the largest bit at about 1 inch. Occasionally, Forstner bits can be found in larger sizes (up to 2 inches in diameter), but rarely are they available in smaller than 3/8 inch. Forstner bits are best suited for use in a drill press or in the chuck of a lathe. Because of the way the cutters on the bottom of the bits slice through wood, they require quite a bit of downward pressure to use, making them less conducive to use with a hand-operated power drill. 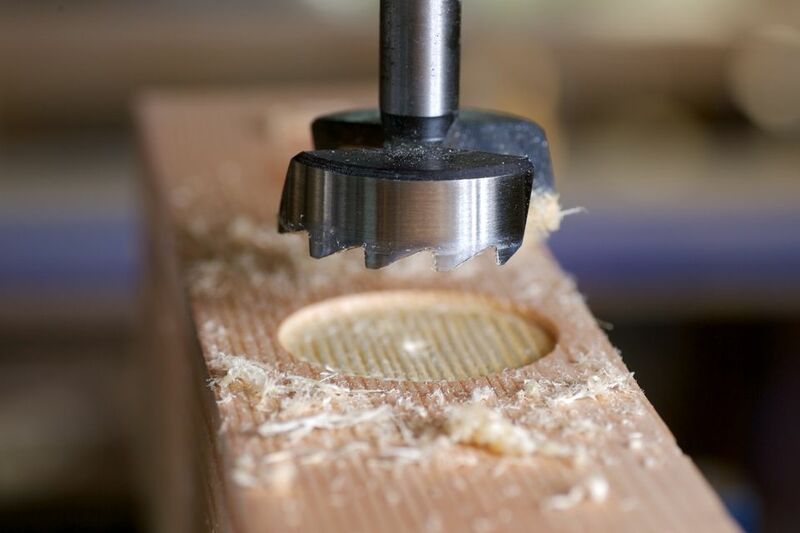 However, with a drill press (and the wood held firmly in place on the table beneath the drill bit), a Forstner bit can cut at angles or cut along the edges of a board, something that one would be hard-pressed to do with a spade or twist drill bit. For all of their advantages, Forstner bits aren't perfect. For instance, they cut rather slowly, and they can heat up if not kept sharp. Additionally, unlike twist drill bits or spade bits, Forstner bits don't do a good job of ejecting the cut material from the hole, so one needs to remove the bit and extract the cut material regularly when using the bit. Are 1/2-Inch Shank Router Bits Better Than 1/4-Inch?